Solar power is not a fad. The necessity of solar panels in 2018 is now undeniable due to its financial, environmental and investment benefits. With the urgency set by 20,000 scientists, we cannot go back to fossil fuel. According to SEIA the U.S. is about to hit 2 million home solar panel system installations in 2018. With the government mandate to install all new homes in California with solar panel systems, solar is here to stay. How much do solar panels increase my home value? According to a Berkeley National Laboratory study, prospective homebuyers are willing to pay $4 for every watt of installed solar panels. For the average home that will increase your home value by $15,000 on average. Additionally according to energy.gov there is evidence suggesting homes with solar panels sell faster. Full disclosure: HahaSmart is a provider of low cost home solar, please keep mind that we may be biased. Niche situations does not always increase your home value. That being said, we do our best to remain objective to help our readers get the best value from our content. You will need to know how to effectively sell a house with solar panels whether you are a homeowner or a real estate agent. 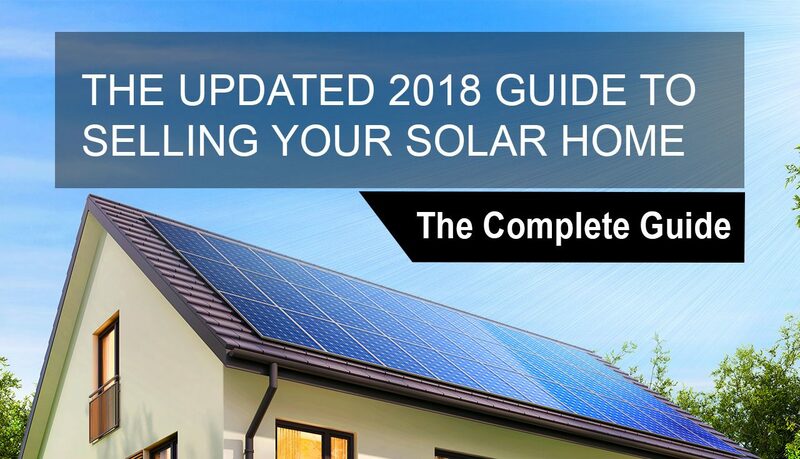 Based on updated feedback from homeowners & agents and our own cross-sectional meta-analytical research of current strategies, we created this complete updated guide to help you sell a home with solar panels in the 2018 real estate market. Important Note: This is the most up-to-date and complete guide because we manually search new strategies and keep this article updated. If you have any strategies not currently included in this guide please email us at marketing(at)hahasmart.com to contribute. We will include your name in the credits section. Let’s begin the process of effectively selling your home. Don’t Lease Solar Panels – If you are buying panels to increase your home value, don’t lease them. No homeowner or bank wants to deal with leased panels. “If they are leased, banks do not recognize a value.” Prospective buyers run away from leased solar panels. They have the complete opposite effect of purchased solar panels. Always purchase panels for home value. If you can’t find a buyer for a home with lease solar panels you may be forced to pay the remaining lease. Based on the remaining time on the lease, you may need to pay between $15,000 to $20,000 on fees. Again, do not lease solar panels. Selling Tip: This is a common problem. If you made the mistake of leasing solar panels, there are real estate agents especially equipped to sell homes with solar loans. Be Cautious When Financing a Home Solar System - You may also encounter similar problems if you purchase panels through a PACE program or HERO loan. These are federally-funded solar loans that help homeowners finance the purchase and installation of their system by paying for the assistance through their property tax bill (typically). Make sure to examine the terms of your contract carefully. Make time to go through The Department of Energy’s PACE Best Practices document. The problem with PACE is it puts a claim on the home. When the borrower defaults on the loan, prospective homebuyers won’t be able to obtain a tax mortgage on the property until it’s paid off. Keep in mind that programs differ. Here are some important details regarding PACE from Ygrene, one of the largest providers of PACE loans. Looks Do Matter – Don’t install panels that make your home ugly. All black seamless mono-crystalline panels are in demand because they complement a home’s aesthetics. Tesla panels look good but triple the price of your system. Panels from emerging next-generation US panel manufacturers like Solaria, Silfab and Mission Solar Energy have panels that are beautifully crafted at a fraction of the price of Tesla. Selling Tip: Keep the aesthetics up and price down by utilizing all black panels in the more exposed parts of your home and standard panels for in-ward facing roofs. Don’t Sell Too Early – One of the main benefits of going solar is the buyback of the panels through electricity savings. If you sell too early and move into a home with no solar panels, you will not have the chance to get the return on your investment. The lower the price of the system the faster the buyback. This can be less of a problem depending on how you do your home solar system valuation, which is what we will teach you next. Typically appraising a solar home includes adding the value of the solar panel system to the property. Make sure to work with an appraiser and agent that has experience in selling solar homes. Solar System Valuation – There are three methodologies on how to value a residential home solar system, Cost Approach Appraisal, Income Approach Appraisal and Market Approach Appraisal. Below I will show you the pros and cons of each solar home value method so you can pick what is best fit for you. This valuation method of a home solar system is based on the projected income a solar system will generate for the owner over the predicted life of the solar system. Advantage: For most homeowners/buyers, income/savings is the most practical way to rationalize investing money into purchasing a solar home. This appraisal method calculates the cost it takes to build the current type of solar system on the home. It does so while making sure the pricing of the system stays consistent with the equipment/build quality. Advantage: It shows the most up-to-date pricing of a new system built in a similar location. Keep in mind, however, the depreciation of the equipment over time. This particular valuation method values the solar panel system by comparing it with other homes that do not have solar installed. This determines how much the market values a solar home by observing the system’s impact on the home’s price in comparison to homes without. Advantage: This is the most common valuation method among appraisers. This can make it easier to know what your prospective buyer’s appraiser will value your home. If you are selling your home through a real estate agent, make sure to pick one that has previous experience selling homes with solar panel systems. He will be better at working with appraisers and prospective buyers to help communicate the benefits of having a home solar system. Most homes are marketed on listing websites such as Realtor, Zillow or Trulia. Prospective home buyers browse these websites and respond accordingly. Get an aesthetic photo of the solar panels – Get a photographer to take a really nice looking photo of your house utilizing a wide-angle lens and a desaturated color profile. The wide-angle enhances the symmetry of your home and the desaturated color profile will improve the visual appeal of the panel on your roof. Sell the house AND the dream – People buy houses for a better lifestyle. Without any emotional momentum as to why they should buy your solar home, your offer won’t stand out if you simply sell based on features. Make sure to tweak your marketing copy to highlight how the solar panel system will make their life so much better versus getting a house without solar panels. This study on 300,000 listings reveal the most used words in real estate. Optimize for niche buyers – In marketing, if you try to appeal to everyone, you will appeal to noone. Make sure to state the benefits of the solar panel system for people who like to lead certain lifestyles such as outdoor enthusiast, pool lovers, electric lovers etc. Facebook Ads - Depending on how advanced your real estate agent is, it is great to utilize Facebook to give your solar home listing more exposure. Selling Tip: Facebook Ads allows you to narrow down ad targeting based on what people like. If you include people who liked Solar related pages and have Solar related interests, you can pinpoint target the best possible prospects. Facebook Friends – Publishing the page on your facebook profile can make it easier for your friends and family to tell their connections about your home. The goal of your marketing is to get prospective buyers to visit your home. Staging is essentially the pitch phase of the home selling process. Unless explicitly included in your real estate agent’s contract, most house staging will cost you around $300-$500. General Staging Advice – Cleaning your house and adding lights to dark spots are great general points in making your home more inviting to prospects. Here is a detailed general guide on how to stage your home. State not having to worry about AC – One of the most amazing benefits of solar is not having to worry about AC. The hotter the sun is, the more power your solar panel produces. This makes it so that you will never have to worry about using too much power when using your AC. Printed materials stating solar savings – Emphasize the savings and convenience they get from buying a solar home. You can do this during home staging by utilizing printed materials placed strategically around your home. A handout can also be a great way to remain top-of-mind when they go home. Most sellers think that the game is over after the house showing. That cannot be farther from the truth. Once you have narrowed down the most qualified and most likely buyers, you should follow up regularly and stay in touch. Share financial incentives for having solar – You should also mention the financial benefits of having a solar home through federal, state and local incentives they might qualify for. This would require doing some homework on your part. Don’t waste your time by doing this for every single prospect, just the top ones. Address concerns – Keep note of explicit and subtextual objections during the staging process. If they look uneasy or asked detailed questions regarding a particular home feature, make sure to send them additional information through email that will ease their fear such as the solar equipment warranties and service warranties included with your system. That is it for the updated 2018 guide for selling your solar home in today’s real estate market. Thank you for taking the time to read through in detail. If you have any additional tips or any corrections please email me at marketing(at)hahasmart.com. We do our best to keep this guide up-to-date and accurate. Please share and this article on your social media profile. This lets us know we are doing a good job. For website owners, we would also appreciate a backlink and give us a quick holler when you do.